MARGARITA MANZKE is the baker and co-owner of République, the Sari Sari Store in L.A.'s Grand Central Market, Petty Cash Taqueria in L.A.'s Fairfax district, and six Wildflour cafe-bakeries in Manila. She is a graduate of the CIA (Hyde Park) and a four-time semifinalist for the James Beard Foundation's Outstanding Pastry Chef award. BETTY HALLOCK is a former staff writer and editor at the Los Angeles Times and the Wall Street Journal. "From simple crisps to traditional German stollen, Margarita Manzke proves her mantra: 'attention to detail makes the baker.' Manzke's enthusiasm for teaching and love for the craft of baking make this one book you'll keep nearby for inspiration and reference - like the pastry case at République, it is exceptional." "Margarita Manzke combines the painstaking rigor and precision of French technique with casual, ingredient-driven Southern California style, and the results are simply magnificent. This collection of recipes manages to feel as classic as it does modern, as soulful as it is refined." "These aspirational recipes will be welcomed by home bakers looking for a challenge." 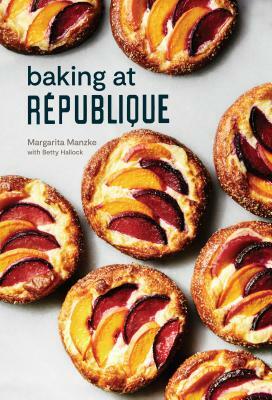 "Pastry chef and co-owner of République Margarita Manzke is the person responsible for your little croissant habit. Yeah, you, ordering 'one of each,' we see you over at that display case. Oh wait, that's our reflection." "The most magical aspect of dining at République, an all-day essential in LA, is apparent the moment you walk through the door. Bountiful rows of pastries line the 15-foot counter, beginning with cakes and pies and gradually moving into filled doughnuts, piles of croissants and kouign amanns, lemon poppy loaves, muffins, and mushroom brioche tarts, among many, many others. The magic of that counter is what pastry chef and co-owner Margarita Manzke, with Betty Hallock, captures in Baking at République."